"Paper folding" redirects here. For other uses of the term, see Paper folding (disambiguation). For other uses of Origami, see Origami (disambiguation). A group of Japanese schoolchildren dedicate their contribution of Thousand origami cranes at the Sadako Sasaki memorial in Hiroshima. Distinct paperfolding traditions arose in Europe, China, and Japan which have been well-documented by historians. These seem to have been mostly separate traditions, until the 20th century. In China, traditional funerals often include the burning of folded paper, most often representations of gold nuggets (yuanbao). The practice of burning paper representations instead of full-scale wood or clay replicas dates from the Song Dynasty (905–1125 CE), though it's not clear how much folding was involved. In Japan, the earliest unambiguous reference to a paper model is in a short poem by Ihara Saikaku in 1680 which mentions a traditional butterfly design used during Shinto weddings. Folding filled some ceremonial functions in Edo period Japanese culture; noshi were attached to gifts, much like greeting cards are used today. This developed into a form of entertainment; the first two instructional books published in Japan are clearly recreational. In Europe, there was a well-developed genre of napkin folding, which flourished during the 17th and 18th centuries. After this period, this genre declined and was mostly forgotten; historian Joan Sallas attributes this to the introduction of porcelain, which replaced complex napkin folds as a dinner-table status symbol among nobility. However, some of the techniques and bases associated with this tradition continued to be a part of European culture; folding was a significant part of Friedrich Froebel's "Kindergarten" method, and the designs published in connection with his curriculum are stylistically similar to the napkin fold repertoire. When Japan opened its borders in the 1860s, as part of a modernization strategy, they imported Froebel's Kindergarten system—and with it, German ideas about paperfolding. This included the ban on cuts, and the starting shape of a bicolored square. These ideas, and some of the European folding repertoire, were integrated into the Japanese tradition. Before this, traditional Japanese sources use a variety of starting shapes, often had cuts; and if they had color or markings, these were added after the model was folded. In the early 1900s, Akira Yoshizawa, Kosho Uchiyama, and others began creating and recording original origami works. Akira Yoshizawa in particular was responsible for a number of innovations, such as wet-folding and the Yoshizawa–Randlett diagramming system, and his work inspired a renaissance of the art form. During the 1980s a number of folders started systematically studying the mathematical properties of folded forms, which led to a rapid increase in the complexity of origami models. Many origami books begin with a description of basic origami techniques which are used to construct the models. This includes simple diagrams of basic folds like valley and mountain folds, pleats, reverse folds, squash folds, and sinks. There are also standard named bases which are used in a wide variety of models, for instance the bird base is an intermediate stage in the construction of the flapping bird. Additional bases are the preliminary base (square base), fish base, waterbomb base, and the frog base. Origami paper, often referred to as "kami" (Japanese for paper), is sold in prepackaged squares of various sizes ranging from 2.5 cm (1 in) to 25 cm (10 in) or more. It is commonly colored on one side and white on the other; however, dual coloured and patterned versions exist and can be used effectively for color-changed models. Origami paper weighs slightly less than copy paper, making it suitable for a wider range of models. Normal copy paper with weights of 70–90 g/m2 (19–24 lb) can be used for simple folds, such as the crane and waterbomb. Heavier weight papers of 100 g/m2 (approx. 25 lb) or more can be wet-folded. This technique allows for a more rounded sculpting of the model, which becomes rigid and sturdy when it is dry. Washi (和紙) is the traditional origami paper used in Japan. Washi is generally tougher than ordinary paper made from wood pulp, and is used in many traditional arts. Washi is commonly made using fibres from the bark of the gampi tree, the mitsumata shrub (Edgeworthia papyrifera), or the paper mulberry but can also be made using bamboo, hemp, rice, and wheat. Artisan papers such as unryu, lokta, hanji, gampi, kozo, saa, and abaca have long fibers and are often extremely strong. As these papers are floppy to start with, they are often backcoated or resized with methylcellulose or wheat paste before folding. Also, these papers are extremely thin and compressible, allowing for thin, narrowed limbs as in the case of insect models. Paper money from various countries is also popular to create origami with; this is known variously as Dollar Origami, Orikane, and Money Origami. It is common to fold using a flat surface, but some folders like doing it in the air with no tools, especially when displaying the folding. Many folders believe that no tool should be used when folding. However a couple of tools can help especially with the more complex models. For instance a bone folder allows sharp creases to be made in the paper easily, paper clips can act as extra pairs of fingers, and tweezers can be used to make small folds. When making complex models from origami crease patterns, it can help to use a ruler and ballpoint embosser to score the creases. Completed models can be sprayed so they keep their shape better, and a spray is needed when wet folding. Origami not only covers still-life, there are also moving objects; Origami can move in clever ways. Action origami includes origami that flies, requires inflation to complete, or, when complete, uses the kinetic energy of a person's hands, applied at a certain region on the model, to move another flap or limb. Some argue that, strictly speaking, only the latter is really "recognized" as action origami. Action origami, first appearing with the traditional Japanese flapping bird, is quite common. One example is Robert Lang's instrumentalists; when the figures' heads are pulled away from their bodies, their hands will move, resembling the playing of music. Modular origami consists of putting a number of identical pieces together to form a complete model. Normally the individual pieces are simple but the final assembly may be tricky. Many of the modular origami models are decorative folding balls like kusudama, the technique differs though in that kusudama allows the pieces to be put together using thread or glue. Chinese paper folding includes a style called Golden Venture Folding where large numbers of pieces are put together to make elaborate models. It is most commonly known as "3D origami", however, that name did not appear until Joie Staff published a series of books titled "3D Origami", "More 3D Origami", and "More and More 3D Origami". Sometimes paper money is used for the modules. This style originated from some Chinese refugees while they were detained in America and is also called Golden Venture folding from the ship they came on. Wet-folding is an origami technique for producing models with gentle curves rather than geometric straight folds and flat surfaces. The paper is dampened so it can be moulded easily, the final model keeps its shape when it dries. It can be used, for instance, to produce very natural looking animal models. Size, an adhesive that is crisp and hard when dry, but dissolves in water when wet and becoming soft and flexible, is often applied to the paper either at the pulp stage while the paper is being formed, or on the surface of a ready sheet of paper. The latter method is called external sizing and most commonly uses Methylcellulose, or MC, paste, or various plant starches. Pureland origami adds the restrictions that only simple mountain/valley folds may be used, and all folds must have straightforward locations. It was developed by John Smith in the 1970s to help inexperienced folders or those with limited motor skills. Some designers also like the challenge of creating within the very strict constraints. Origami tessellation is a branch that has grown in popularity after 2000. A tessellation is a collection of figures filling a plane with no gaps or overlaps. In origami tessellations, pleats are used to connect molecules such as twist folds together in a repeating fashion. During the 1960s, Shuzo Fujimoto was the first to explore twist fold tessellations in any systematic way, coming up with dozens of patterns and establishing the genre in the origami mainstream. 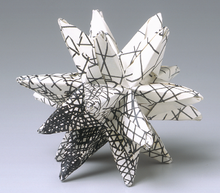 Around the same time period, Ron Resch patented some tessellation patterns as part of his explorations into kinetic sculpture and developable surfaces, although his work was not known by the origami community until the 1980s. Chris Palmer is an artist who has extensively explored tessellations after seeing the Zilij patterns in the Alhambra, and has found ways to create detailed origami tessellations out of silk. Robert Lang and Alex Bateman are two designers who use computer programs to create origami tessellations. The first international convention devoted to origami tessellations was hosted in Brasília (Brazil) in 2006, and the first instruction book on tessellation folding patterns was published by Eric Gjerde in 2008. Since then, the field has grown very quickly. Tessellation artists include Polly Verity (Scotland); Joel Cooper, Christine Edison, Ray Schamp and Goran Konjevod from the USA; Roberto Gretter (Italy); Christiane Bettens (Switzerland); Carlos Natan López (Mexico); and Jorge C. Lucero (Brazil). Kirigami is a Japanese term for paper cutting. Cutting was often used in traditional Japanese origami, but modern innovations in technique have made the use of cuts unnecessary. Most origami designers no longer consider models with cuts to be origami, instead using the term Kirigami to describe them. This change in attitude occurred during the 1960s and 70s, so early origami books often use cuts, but for the most part they have disappeared from the modern origami repertoire; most modern books don't even mention cutting. Strip folding is a combination of paper folding and paper weaving. A common example of strip folding is called the Lucky Star, also called Chinese lucky star, dream star, wishing star, or simply origami star. Another common fold is the Moravian Star which is made by strip folding in 3-dimensional design to include 16 spikes. The practice and study of origami encapsulates several subjects of mathematical interest. For instance, the problem of flat-foldability (whether a crease pattern can be folded into a 2-dimensional model) has been a topic of considerable mathematical study. A number of technological advances have come from insights obtained through paper folding. For example, techniques have been developed for the deployment of car airbags and stent implants from a folded position. The problem of rigid origami ("if we replaced the paper with sheet metal and had hinges in place of the crease lines, could we still fold the model?") has great practical importance. For example, the Miura map fold is a rigid fold that has been used to deploy large solar panel arrays for space satellites. Origami can be used to construct various geometrical designs not possible with compass and straightedge constructions. For instance paper folding may be used for angle trisection and doubling the cube. Technical origami, known in Japanese as origami sekkei (折り紙設計), is an origami design approach in which the model is conceived as an engineered crease pattern, rather than developed through trial-and-error. With advances in origami mathematics, the basic structure of a new origami model can be theoretically plotted out on paper before any actual folding even occurs. This method of origami design was developed by Robert Lang, Meguro Toshiyuki and others, and allows for the creation of extremely complex multi-limbed models such as many-legged centipedes, human figures with a full complement of fingers and toes, and the like. The pattern of allocations is referred to as the 'circle-packing' or 'polygon-packing'. Using optimization algorithms, a circle-packing figure can be computed for any uniaxial base of arbitrary complexity. Once this figure is computed, the creases which are then used to obtain the base structure can be added. This is not a unique mathematical process, hence it is possible for two designs to have the same circle-packing, and yet different crease pattern structures. As a circle encloses the maximum amount of area for a given perimeter, circle packing allows for maximum efficiency in terms of paper usage. However, other polygonal shapes can be used to solve the packing problem as well. The use of polygonal shapes other than circles is often motivated by the desire to find easily locatable creases (such as multiples of 22.5 degrees) and hence an easier folding sequence as well. One popular offshoot of the circle packing method is box-pleating, where squares are used instead of circles. As a result, the crease pattern that arises from this method contains only 45 and 90 degree angles, which often makes for a more direct folding sequence. A number of computer aids to origami such as TreeMaker and Oripa, have been devised. TreeMaker allows new origami bases to be designed for special purposes and Oripa tries to calculate the folded shape from the crease pattern. Copyright in origami designs and the use of models has become an increasingly important issue in the origami community, as the internet has made the sale and distribution of pirated designs very easy. It is considered good etiquette to always credit the original artist and the folder when displaying origami models. It has been claimed that all commercial rights to designs and models are typically reserved by origami artists; however, the degree to which this can be enforced has been disputed. Under such a view, a person who folds a model using a legally obtained design could publicly display the model unless such rights were specifically reserved, whereas folding a design for money or commercial use of a photo for instance would require consent. The Origami Authors and Creators group was set up to represent the copyright interests of origami artists and facilitate permissions requests. However, a court in Japan has asserted that the folding method of an origami model "comprises an idea and not a creative expression, and thus is not protected under the copyright law". Further, the court stated that "the method to folding origami is in the public domain; one cannot avoid using the same folding creases or the same arrows to show the direction in which to fold the paper". Therefore, it is legal to redraw the folding instructions of a model of another author even if the redrawn instructions share similarities to the original ones, as long as those similarities are "functional in nature". The redrawn instructions may be published (and even sold) without necessity of any permission from the original author. The Japanese decision is arguably in agreement with the U.S. Copyright Office, which asserts that "copyright does not protect ideas, concepts, systems, or methods of doing something." These pictures show examples of various types of origami. In House of Cards season 1, episode 6, Claire Underwood gives a homeless man cash, and he later returns it folded into the shape of a bird. Claire then begins making origami animals, and in episode 7 she gives several to Peter Russo for his children. In Blade Runner, Gaff folds origami throughout the movie, and an origami unicorn he folds forms a major plot point. The philosophy and plot of the science fiction story "Ghostweight" by Yoon Ha Lee revolve around origami. In it, origami serves as a metaphor for history: "It is not true that the dead cannot be folded. Square becomes kite becomes swan; history becomes rumor becomes song. Even the act of remembrance creases the truth". A major element of the plot is the weaponry called jerengjen of space mercenaries, which unfold from flat shapes: "In the streets, jerengjen unfolded prettily, expanding into artillery with dragon-shaped shadows and sleek four-legged assault robots with wolf-shaped shadows. In the skies, jerengjen unfolded into bombers with kestrel-shaped shadows." The story says that the word means the art of paper folding in the mercenaries' main language. In an interview, when asked about the subject, the author tells that he became fascinated with dimensions since reading the novel Flatland. The 2010 video game Heavy Rain has an antagonist known as the origami killer. In the BBC television program QI it is revealed that origami in the form it is commonly known, where paper is folded without being cut or glued likely originated in Germany and was imported to Japan as late as 1860 when Japan opened its borders (although less specific Japanese paper-craft did exist in prior to this). ^ UNESCO - Intangible Heritage Section. "UNESCO Culture Sector - Intangible Heritage - 2003 Convention :". ^ Merali, Zeeya (June 17, 2011), "'Origami Engineer' Flexes to Create Stronger, More Agile Materials", Science, 332 (6036): 1376–1377, doi:10.1126/science.332.6036.1376, PMID 21680824 . ^ Robert Lang (16 Mar 2019). "See a NASA Physicist's Incredible Origami" (video). Southwest Daily News. ^ Laing, Ellen Johnston (2004). Up In Flames. Stanford University Press. ISBN 978-0-8047-3455-4. ^ Hatori Koshiro. "History of Origami". K's Origami. Retrieved January 1, 2010. ^ Joan Sallas. "Gefaltete Schönheit." 2010. ^ "History of Origami in the East and West before Interfusion", by Koshiro Hatori. From Origami^5, ed. Patsy Wang Iverson et al. CRC Press 2011. ^ Margalit Fox (April 2, 2005). "Akira Yoshizawa, 94, Modern Origami Master". New York Times. ^ Lang, Robert J. "Origami Design Secrets" Dover Publications, 2003. ^ Rick Beech (2009). The Practical Illustrated Encyclopaedia of Origami. Lorenz Books. ISBN 978-0-7548-1982-0. ^ Jeremy Shafer (2001). Origami to Astonish and Amuse. St. Martin's Griffin. ISBN 0-312-25404-0. ^ Bettens, Christiane. "First origami tessellation convention". Flickr. Retrieved July 20, 2015. ^ Gjerde, Eric (2008). Origami Tessellations. Taylor & Francis. ISBN 9781568814513. ^ Lang, Robert J. (2003). Origami Design Secrets. A K Peters. ISBN 1-56881-194-2. ^ a b "Strip folding". Origami Resource Center. 2018. Retrieved 2018-02-19. ^ The World of Geometric Toy, Origami Spring, August, 2007. ^ Cheong Chew and Hiromasa Suziki, Geometrical Properties of Paper Spring, reported in Mamoru Mitsuishi, Kanji Ueda, Fumihiko Kimura, Manufacturing Systems and Technologies for the New Frontier (2008), p. 159. ^ Patsy Wang-Iverson; Robert James Lang; Mark Yim, eds. (2010). Origami 5: Fifth International Meeting of Origami Science, Mathematics, and Education. CRC Press. pp. 335–370. ISBN 978-1-56881-714-9. ^ Lang, Robert. "TreeMaker". Retrieved April 9, 2013. ^ Mitani, Jun. "ORIPA: Origami Pattern Editor". Retrieved April 9, 2013. ^ Robinson, Nick (2008). Origami Kit for Dummies. Wiley. pp. 36–38. ISBN 978-0-470-75857-1. ^ "Origami Copyright Analysis+FAQ" (PDF). OrigamiUSA. 2008. p. 9. ^ "Japanese Origami Artist Loses Copyright Battle With Japanese Television Station". Keissen Associates. Retrieved 3 Sep 2015. ^ "What Does Copyright Protect?". Copyright.gov. United States Copyright Office. Retrieved 4 Sep 2015. ^ "House of Cards: Chapter 6". AV Club. ^ "House of Cards: Chapter 7". AV Club. ^ Greenwald, Ted. "Q&A: Ridley Scott Has Finally Created the Blade Runner He Always Imagined". Wired. Retrieved 14 March 2015. ^ "Interview: Yoon Ha Lee, Author of Conservation of Shadows, on Writing and Her Attraction to Space Opera"". SF Signal. 30 May 2013. Retrieved 27 March 2017. ^ Guide, British Comedy. "QI Series O, Episode 10 - Origins And Openings". British Comedy Guide. Retrieved 13 January 2019. The art of folding paper into shapes without cutting it comes from Germany. Origami uses white paper, which can be folded and cut. German kindergartens use paper that is uncut and is coloured on one side, and this came into Japan when the country opened its borders in 1860. Thus what we generally consider origami today in fact has German roots. A book for a more advanced origamian; this book presents many more complicated ideas and theories, as well as related topics in geometry and culture, along with model diagrams. An extremely complex book for the elite origamian, most models take 100+ steps to complete. Includes his famous Divine Dragon Bahamut and Ancient Dragons. Instructions are in Japanese and English. Nick Robinson (2004). Encyclopedia of Origami. Quarto. ISBN 1-84448-025-9. A book full of stimulating designs. Lang, Robert (February 2008). "The math and magic of origami" (video). TED ED. Retrieved April 6, 2013. Robert Lang (16 Mar 2019). "See a NASA Physicist's Incredible Origami" (video). Southwest Daily News. This page is based on the Wikipedia article Origami; it is used under the Creative Commons Attribution-ShareAlike 3.0 Unported License (CC-BY-SA). You may redistribute it, verbatim or modified, providing that you comply with the terms of the CC-BY-SA.